Glaucoma refers to a group of eye diseases which involves damage to the optic nerve (the nerve that connects the eye to the visual processing centers of the brain). The damage to optic nerve eventually causes characteristic changes to the peripheral vision, and if not controlled, can progress to affect central vision, and in severe cases, all vision. Glaucoma is not a curable disease, and damage caused by the illness isn’t reversible, but treatment and regular checkups can prevent visual loss in people with early signs of glaucoma. If visual loss has already occurred, treatment can slow or prevent further vision loss. Two categories of glaucoma are "open angle glaucoma" and "closed angle glaucoma". The angle refers to the space formed by the outer edges of the iris and the cornea. The iris is the flat blue, brown, or green part of our eye. The hole in the middle of the iris is the pupil. The cornea is the dome shaped window that forms the front of the eye. If an eye is looking straight upward, the cornea is like a dome shaped roof that continues right down to the floor. The floor, in turn, is the flat iris. At their outer edges where they meet, the flat iris and the curved cornea form the 'angle'. The angle is an important place because it contains the drain of the eye. Every eye that's alive constantly produces fluid within itself. This fluid drains out of the eye through the drain and then goes into the bloodstream. If the drain doesn't function normally, the pressure in the eye increases. When pressure reaches a level that is too high for the health of the optic nerve, glaucoma damage occurs. By far, the most common form of glaucoma is 'open angle glaucoma'. In these cases, the drain of the eye is visible with a special lens. In angle closure glaucoma, the drain is blocked by the peripheral iris. In that case, the iris rides up at the edge and pushes against the cornea, thereby covering the drain and closing the angle. In both cases, open and closed angle glaucoma, there is an impairment of drainage. It is like having a blocked drain in a kitchen sink. Sometimes the opening of the drain looks clear, but yet the water goes down very slowly. Other times there is food, or a plate that has completely and obviously covered the opening of the drain itself. Open angle glaucoma is like the first example. The drain opening looks fine, but the slow exit of water means there is blockage further down in the pipes. Water drains, but not normally. The second example where some food or a plate has completely covered the drain opening is like angle closure glaucoma. The drain is no longer visible and no water gets out. 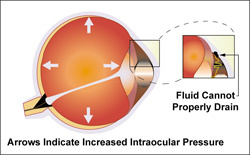 When an angle closes, the continuing production of fluid causes the eye pressure to quickly rise. In just a couple of hours, the pressure can rise to extremely high levels. High pressure can stop the circulation to the retina and the optic nerve and can cause irreversible severe damage to both. Eye redness occurs. Significant eye and head pain are almost always present and nausea is common. This is an "acute glaucoma attack". The situation is an eye emergency as pressure needs to be relieved ASAP to limit permanent vision loss. How is glaucoma typically treated? If a patient is diagnosed with glaucoma, there are several treatments available. If you have any concerns or questions regarding glaucoma or would like more information on glaucoma, please contact our office to set up an evaluation or consult with your eye care professional.